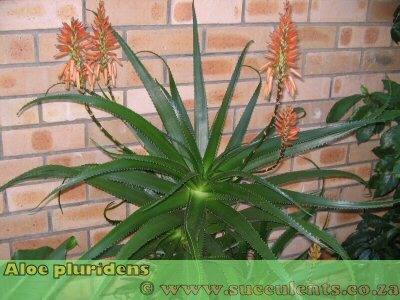 Aloe pluridens is similiar to Aloe angelica and Aloe arborescence. Aloe arborescence has a different type od sap that Aloe pluridens and it is not as tall and slender. Aloe angelica has a different distribution pattern and the racemes are head shape. The specie name 'pluridens' means many teeth and it refers to the numerous small white teeth that are present on the leaf margins. Aloe pluridens has been granted tree status and its national tree number is 30.1. Common Names: Fraansaalwyn or French Aloe. Distribution: Aloe pluridens is often found in thick vegetation, it occurs on a band along the coast from Durban westwards to Humansdorp in the Eastern Cape. Stem: Stems are solitary or branched. Upper parts of the stem is covered in old dried leaves. Leaves: Leaves are recurved, bright green in colour. Leaf surfaces are smooth, leaf margins are armed with numerous small white teeth. Inflorescence: Inflorescence is complex and branched into four racemes that are cone shaped. Flower: Flowers are orange to pinkish-red and occasionally yellow. Flowering Time: Flowering occurs in the winter months from May to July. Aloe pluridens make a nice addition to the garden but it requires frost protection. Grow in a soil that is well draining to help prevent diseases such as rot. Aloe pluridens is known to be less susceptible to snout beetle infestations.